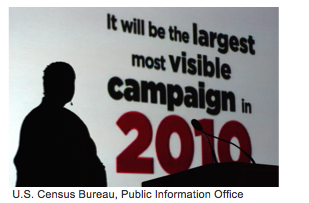 You might not be aware of it yet, but the US Census began March 1. Beyond filling out and mailing a form at some point in the near future, most of us won't give it a second thought—and won't have to worry about it for another decade. If you're looking for work, however, it might be something that's worth considering a little longer: the surveys that don't get mailed back have to be tracked down and recorded by real, live people. And, despite the fact that it's already underway, there are a number of areas around the country where the Census Bureau is still hiring—little wonder, considering the Bureau needs an estimated 3.8 million eligible workers on hand by the end of April. A USA Today article points to some of the places around the country where the Census Bureau is facing acute shortages of workers. Mostly, it's in areas that have been less badly affected by the recession, although other reasons for worker shortages include places like Martha's Vineyard, where there aren't enough residents to draw a hiring pool from. Jump to the full list. The USA Today list is far from exhaustive, either, as a little time on Google will show. In just a couple of minutes, I came across several local listings in newspapers across the country, so it's well worth checking in with your own—or contacting your local Census office to find out if there are any vacancies. The locales I unearthed include: Shreveport, LA, Troy, AL, Altavista, VA, Garfield County, OK, Cherokee County, GA, and many more. And, such is the need in Southwestern Louisiana for accurate information as the region attempts to rebuild in the aftermath of Hurricane Katrina, the Census Bureau has gone as far as putting out a special notice detailing its upcoming operations. As recently as three weeks ago, the region was still some 4,000 workers short of its target of 6,700 takers. Pay and conditions for workers typically varies from district to district. While workers in New Orleans can expect to make $17.50 an hour for their efforts, those in Buffalo, NY are being offered $13.50. All selected will be expected to work somewhere between 20 and 40 hours per week, although the Bureau cautions that the majority of those hours will be when people are most likely to be home—so be prepared to be working your beat on evenings and weekends. Aside from being able to find your way around—and being physically fit enough for the demands of the job—the major skill required is an ability to "explain the purpose of the census." Beyond that, the job description involves conducting "brief personal interviews with residents" and recording their responses "on paper forms." A practice test is available for those who'd like to check whether they have what it takes (and to practice before an interview, obviously). All told, we're talking legitimate, respectable, short-term work—and it'll leave you plenty of free time during weekdays to continue your full-time job search. And even if you don't agree with any of that: it pays, and they're hiring at a time when very few others are.